The good thing about Italy is that summer here tends to last much longer. Usually between five and six months, I would say, considering that from the end of March onwards the temperatures start to steadily climb over 20 degrees Celsius in order to reach a pinnacle of about 40 between July and August. So, the bad thing about Italian summer is that, at times, it can get almost too hot. I am not complaining really. I will happily take any sunny day over a rain-splattered one. Still, when it’s hot, it’s hot and when it’s unbearably hot, you need not only to cool down but to keep your energy levels up so as not to slump. Thankfully, the Italians are great at food and beverages in addition to being dedicated coffee-lovers. So, they have managed to develop and perfect three great coffee-based drinks which are cooling, refreshing and re-energising all at the same time. 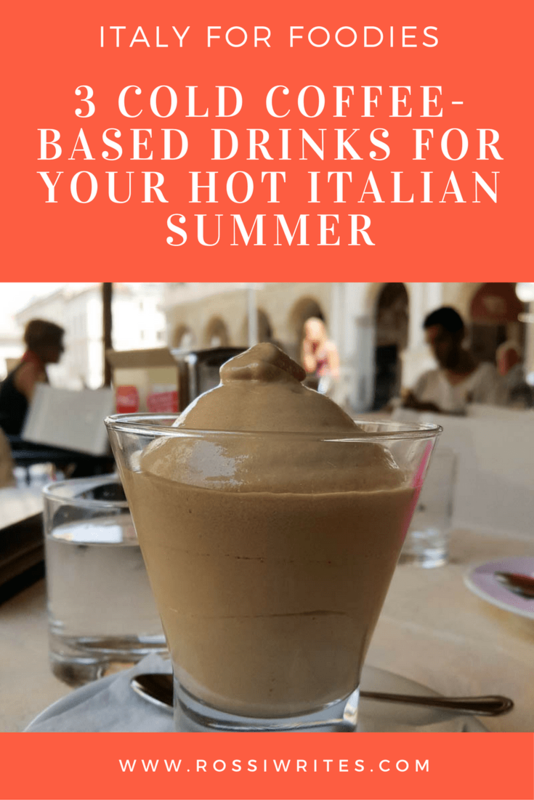 Now, let me tell you a bit more about each one of them, so that, next time that you are sweating under the hot, hot Italian sun and you are simply dreading to think about the large number of sights you still need to tick off, you know exactly what to order to give yourself a bit of a cold boost. This is a very elegant drink which is customarily served in a tall glass. It has a very nice thick froth and it is light and uplifting to have. It is made with a long shot of strong espresso and ice which are energetically shaken together in a metal shaker, not unlike cocktails. When you order it, you will be asked if you want it with sugar (hence ‘sweet’ – In Italian ‘dolce’ or ‘zuccherato’) or not (hence ‘bitter’ – in Italian ‘amaro’). Personally, I usually drink my coffees sugar-free, but at the same time I always ask for sugar in my caffè shakerato. For some reason, I find its bitter version a bit too tart to have. So, make sure that you try both versions to decide for yourself. If you want to jazz up the base version of caffè shakerato a bit, you can ask for whipped cream (panna) and/or chocolate to be added to it. Another option is to have it shaken with a shot of sweet liquor. Normally, a caffè shakerato costs between 2.50 and 3.00 euros. Expect to pay more for add-ons like panna and alcohol. 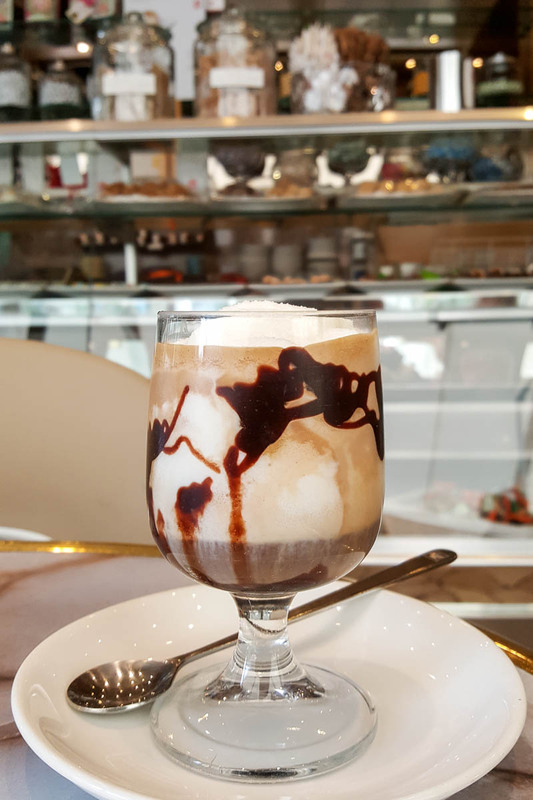 Here you will find mixed together two of Italy’s main pleasures – espresso and gelato! The name of this type of drink means literally ‘drowned coffee’. 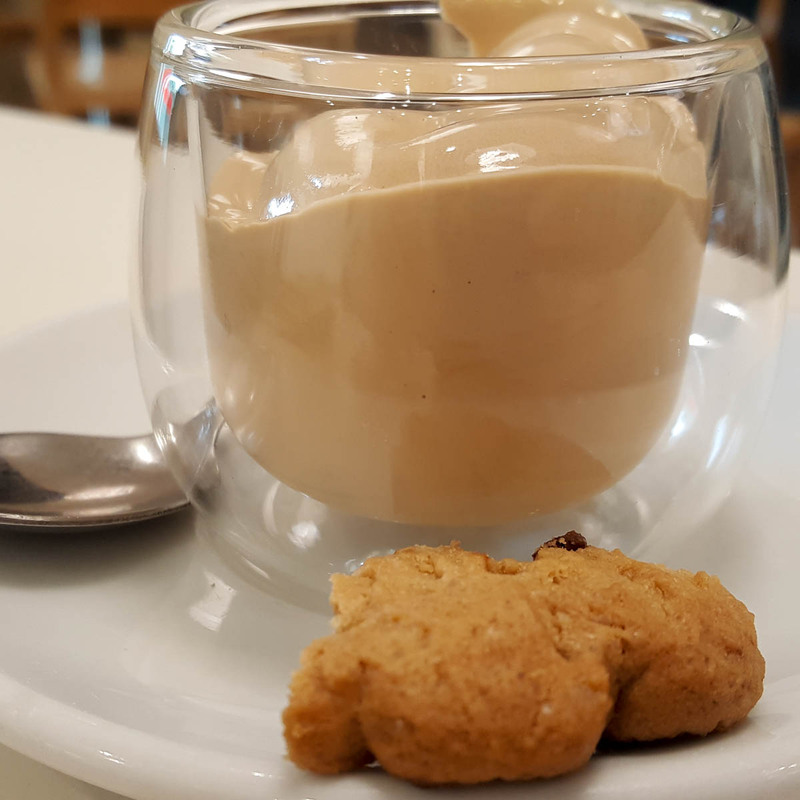 This is so because it is prepared by placing a scoop of (traditionally, vanilla) gelato in a glass, cooling it down a bit, so that the gelato doesn’t melt and then pouring on top of it a shot of freshly made espresso. Thus, you can scoop your gelato bit by bit with the coffee coating each bite. It is simple, yet decadent and you can find it served in its simple form or in much more extravagant versions everywhere in Italy. Just look at this glorious caffè affogato I got in a small coffee shop in Vicenza, where they really went out of their way by drizzling the glass with chocolate syrup and then really filling it with gelato. You can expect to pay anything from 2.00-2.20 euros upwards. It will depend on the city and the place. My all-time personal favourite. I haven’t missed an opportunity to treat myself to one all summer long. 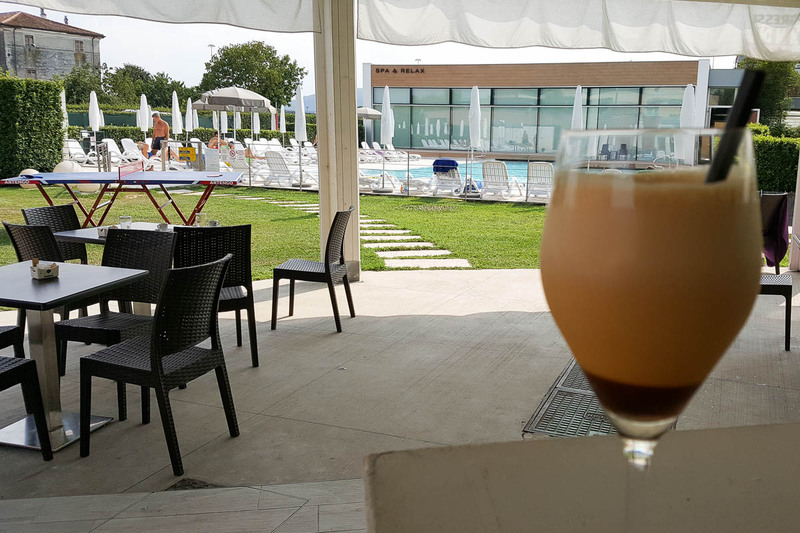 A caffè crema is like a slush puppy for grown-ups. Basically, it is a frozen cream and coffee mixture which is slushed by a machine. 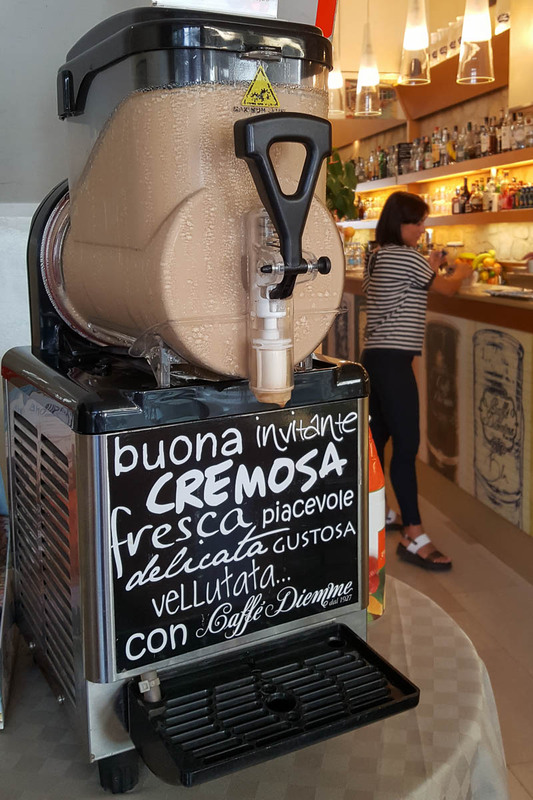 As soon as the weather starts heating up, these machines get positioned in Italy’s bars and coffee shops, ready for the brisk business. 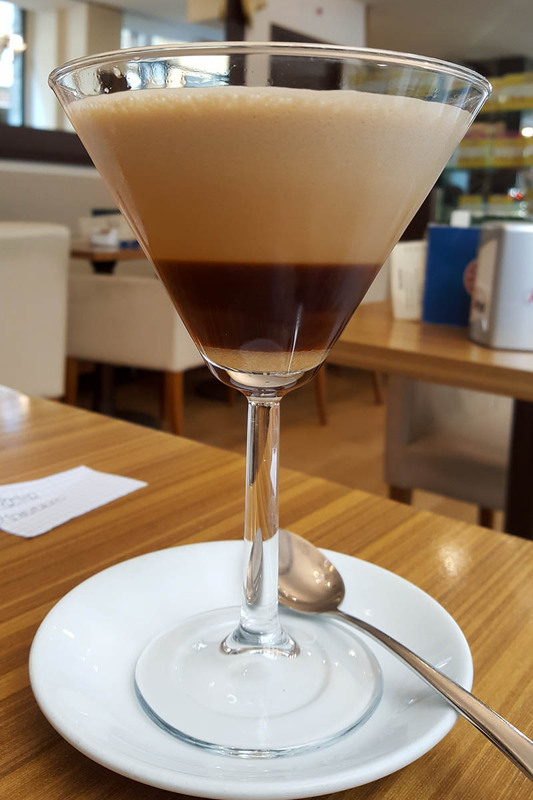 Caffè crema is served in glasses, too and you can, ordinarily, order it in different sizes. It comes with a small spoon for you to scoop it out of the glass, as you can’t really drink it. It is more to be savoured bit by bit. A small glass usually costs between 2.00 and 2.50 euros. Expect to pay more at a touristic place. Which one is your favourite cold coffee-based drink? Let me know.